There are three major types of water turbines. The Pelton turbine requires large water head and low flow rate, and the Kaplan turbines require low water head but large flow rate. The Pelton turbines usually build in mountainous regions, while the Kaplan turbines are located in low lands. These restrictions make these two kind turbines less common than the Francis Turbine. The Francis turbine fills a large gap between the Pelton and Kaplan and it is widely used. They operate in water head from 10 to 600 meters, and primarily use for electric power generation. Their power output can be calculated from the water head and flow rate and typically range from 10 to more than 700 megawatts. One of the distinct advantages of the Francis turbine with respect to other water turbine is that, they can also be used as water pump. This makes them ideal for the pumped storage systems. 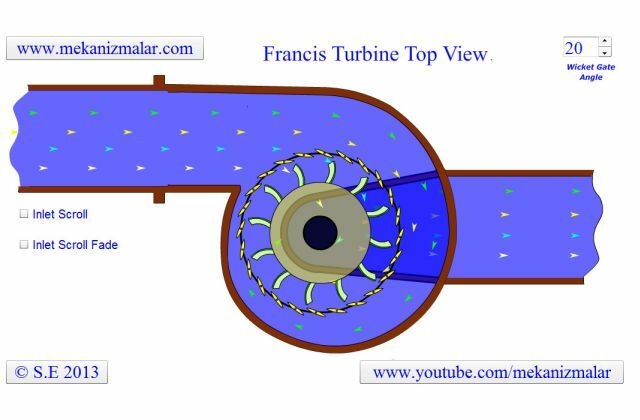 This animation shows the top view of a Francis Turbine. The arrows show the water path inside the turbine. Flow rate of the water shown by the speed of arrows. The water coming from the penstock is transferred to the inlet scroll, which distributes the water equally around the runner. Water passes through the wicket gates before reaching to the runner. The wicket gates control the amount of water passing through the turbine. This in effect controls the power output of the turbine. If the power requirement in the grid is low, the wicket gates narrows the water passage and reduces power output of the turbine, while preventing excessive water usage. After passing through the wicket gates, the water reaches the runner. The water pressure forces the runner to rotate. This rotation motion transferred to an electric generator, not shown in this animation. The water continues its motion downward under the runner to the exit pipe. The exit pipe discharges the water to the environment as low pressure water. In here we see actual inlet scroll used in Grand Coulee dam inlet scroll superimposed on our animation. If you notice four workers and a long ladder are located in here. This can give you some idea about the sheer size of the inlet scroll. The penstock diameter of a Francis turbine could be as large as 10 meters, which is 33 feet. The rotation speed of the runner can be in the range of 80 to 1000 rpm. The turbine shaft of the Francis turbine is almost always mounted vertically. This makes discharge of the water much easier due to swirling of the water in the inlet scroll, and the effect of the gravity.